Mama is actually the name of a Brand of our Instant Noodles. But Thai people call all the instant noodles Mama, even though they might bear the name WaiWai on the label. All the Instant noodle in Thailand imitate the flavor of our famous dishes. You can have the instant noodle with Tomyam Goong Flavor, mince pork flavor or Boat Noodle flavor and etc. What I use today is spicy Stir-fry or Pad Khimao in Thai. 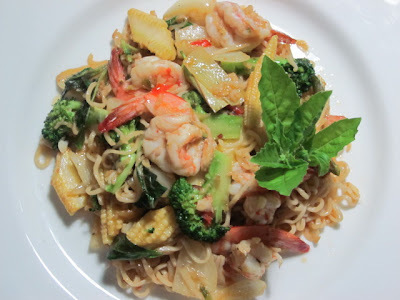 Pad Khimoa is often with seafood, so I add fresh Shrimps into this dish and some vegetables and the holy basil because it is a must in any Pad Khimao. I also add the paste that come in the package of instant noodle to make it more intensive. But actually you can use any kind of instant noodle to make this, if you add all the other ingredients listed, you will sure have the good spicy Pad Khimao. Fresh Shrimps 150 grams Clean and peel, leave the tail intact, cut open the back to remove the black line. Boil the noodle in boiling water for a few minute until the noodle is cooked but not too soft. Cut open the little paste packages that come in the pack, we will use this for seasoning as well. Fry the Chili paste with 3 tablespoon of vegetables oil, when the Chili paste is frying and giving out chili Smell, add the onion, baby corn and broccoli. Add the given Sauce and Chili powder that come with the pack and mix them well. 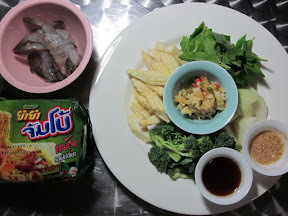 Add the fresh shrimps into the fry, when the shrimps turn pink, add the cooked noodle. Season with Soya Sauce and Sugar and try the taste, when you are satisfied, add the holy basil and stir them well together. Best serve when hot. This fry noodle is done in a relatively short frying time, otherwise the noodle will become too soft or soggy. For Seasoning you can also use fish sauce, if you prefer intensive aroma of the Fish Sauce, I wasn’t sure how salty the chili powder will be, so I go for soya sauce. But you can decide after your own taste.